“Who is that! ?” Scene-stealer Gianluca Buratto. “It’s not easy being green”: especially if you’re the two greatest Italian opera composers. In their eighth decade Verdi and Monteverdi likely each thought they were done writing works for the stage but the gods had other plans. While Otello and Falstaff are familiar fare worldwide, the towering masterworks Il Ritorno d’Ulisse in Patria and L’Incoronazione di Poppea, occur far less often. So raptly intent and wildly enthusiastic audiences were grateful that Lincoln Center’s 2017 White Light Festival opened last week with wonderfully intense, beautifully prepared semi-staged performances of these works by forces led by Sir John Eliot Gardiner. As this year marks the 450th anniversary of Monteverdi’s birth, Gardiner and his aptly-named Monteverdi Choir and English Baroque Soloists conceived an ambitious months-long worldwide tour of the master’s three extant operas. Opening in Aix-en-Provence in April, the series concluded with the Alice Tully Hall shows, Ulisse’s 13th and Poppea’s 10th. As I had heard these groups and many of the same soloists perform L’Orfeo (1607) at Carnegie Hall several years ago, I opted for just the later works which premiered at Venice’s Teatro Cassiano in the early 1640s when the composer was in his mid-70s. Le Nozze d’Enea con Lavinia, a third opera which opened around this same time, has not survived—one of music’s greatest losses. One occasionally encounters the term “Shakespearian” describing these two operas presumably as an attempt to capture the epic sweep of both Ulisse and Poppea with their panoply of shrewdly drawn characters, a compelling mix of low and high, from comic servants to lofty gods. Giacomo Badoaro’s text for Ulisse and especially Francesco Buenello’s for Poppea are among opera’s richest and most satisfying. Gardiner’s orchestra was divided in half and the singers entered and exited through a path that separated the instrumental groups and performed both in front of the band and on a long platform at the rear running the width of the stage. The conductor and his co-director Elsa Rooke provided lucid, effective stagings that did justice to both the rollicking humor and the intense pathos. Costumes were simple gowns or tunics that evoked either the story’s ancient roots or its 17th century composition. What remains fascinating about the performance of any Monteverdi opera is that one never knows quite what one is going to get going in. Each conductor must choose or prepare his or her own realization of the score and Gardiner’s definitely fell into the more elaborate camp. His large (and splendid) orchestra for Ulisse numbered twenty-five including no fewer than four chitarrones/lutes with a harpsichord and organ for each half of the group. As the tour would be playing in a wide variety of theaters, perhaps the lush orchestration seemed warranted but on more than one occasion it struck me as over-powering for a space the size of Tully, and the elaborate instrumentation was unnecessarily ornate and fussy particularly the overuse of solo violin obbligato. Such a large band no doubt required Gardiner to conduct absolutely every moment, a phenomenon one doesn’t always see in Monteverdi performances where the singers often interact independently with the continuo players. But this determine oversight served notice that these were rigidly controlled interpretations, strongly theatrical but occasionally lacking in nuance and spontaneity. Gardiner’s origins as a choral conductor came to the fore when he used twelve or more singers for numbers usually done by just several soloists. These occasions were nonetheless thrilling, particularly several in Ulisse, but the hearty men’s chorus at the end of Poppea verged on deafening. Many of the soloists took part in both operas, often in more than one role. Unfortunately, Ulisse and Poppea were marred by weaknesses in their central couples. Marianna Pizzolato was announced as indisposed the night she sang Penelope and there was also an announcement that she was still ailing as Penelope on Saturday before she was to sing Ottavia! She may have been a bit underpowered as Penelope but the greater problem was a lack of nobility, of gravitas without which the long-suffering wife can seem a bit of a bore. A video of a Ulisse from Venice earlier in the tour shows that the young French contralto Lucile Richardot was a more intense and moving Penelope. However, Pizzolato’s Ottavia, on the other hand, was altogether more successful, combining an aching sadness at being abandoned by Nerone with a vicious thirst for revenge. Furio Zanasi as Penelope’s long-absent husband is an assured stylist in this repertoire but unsurprisingly he was less commanding than he had been when I saw him in the role in William Kentridge’s breezy production here more than a decade ago. Gardiner’s Nerone, Kangmin Justin Kim joined a long line of countertenors recently taking on a role more usually performed by women. Although David Daniels was astonishing, others like Philippe Jaroussky, Max Emanuel Cencic and Jacek Laszczkowski have found the role uncomfortably high and ended up screaming a lot. Kim too fell into the same trap, particularly in the third act. As his partner in love and ambition Czech soprano Hana Blaziková proved frustrating. She enacted a Poppea more romantic and less baldly ambitious than some have and sang her softly sensuous music sweetly. But when the line grew loud or high her tone turned tight and glassy. She was altogether more successful on Thursday as a high-spirited Minerva who masterminded the hero’s return and who herself enacted the slaughter of the three suitors. In addition to Penelope, Richardot also sang Poppea’s nurse Arnalta but in New York the role was performed by American countertenor Reginald Mobley who sweetly floated her haunting lullaby but lacked the gutsy punch to put over her uproarious final monologue. Familiar from the Les Arts Florissants production of Ulisse, Robert Burt ably repeated his obstreperous yet ultimately pathetic Iro. The delightful English soprano Anna Dennis was perhaps more worldly and knowing than the ideal Drusilla; with her bright, secure top she might have made a more satisfying Poppea than Blaziková. As Melanto in Ulisse Dennis partnered with tenor Zachary Wilder as Eurimaco and their deliciously horny romps contrasted strikingly with Penelope’s sedate steadfastness. 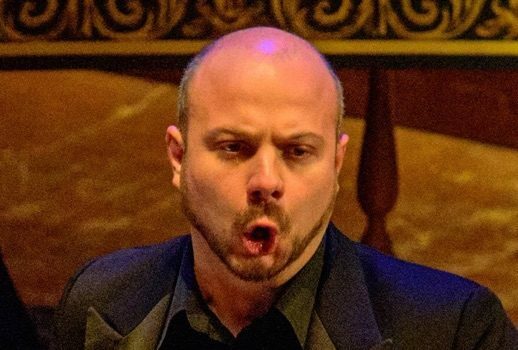 Also an agile Lucano, Wilder was just one of the ensemble’s six fine laureates of William Christie’s “Le Jardin des Voix” apprentice program for promising singers of early music. Others included Carlo Vistoli as an achingly vulnerable Ottone; Michal Czerniawski whose sly Nutrice was a delightful cameo in Poppea; John Taylor Ward, particularly moving as Mercurio announcing Seneca’s death; Francisco Fernández-Rueda occasionally rough and raw as Eumete; and a charming Francesca Boncompagni under-employed as Damighella. He dominated the first evening in three roles: after his buzzing Tempo, he embodied a thundering Nettuno and a villainous, strutting Antinoo. In Poppea Buratto’s grave and noble Seneca made his suicide scene one of the evening’s many high points. I suspect I’m not the only one eager to hear this stylish singer again and soon! Although Monteverdi may not have written the first opera, he composed the art form’s first masterpieces with Poppea easily one of few candidates for the greatest opera ever written. While his mid-17th century recitative-oriented idiom might not be everyone’s glass of grappa these works are surely worth the time and effort and their rewards can be enormous as Gardiner’s interpretations proved.